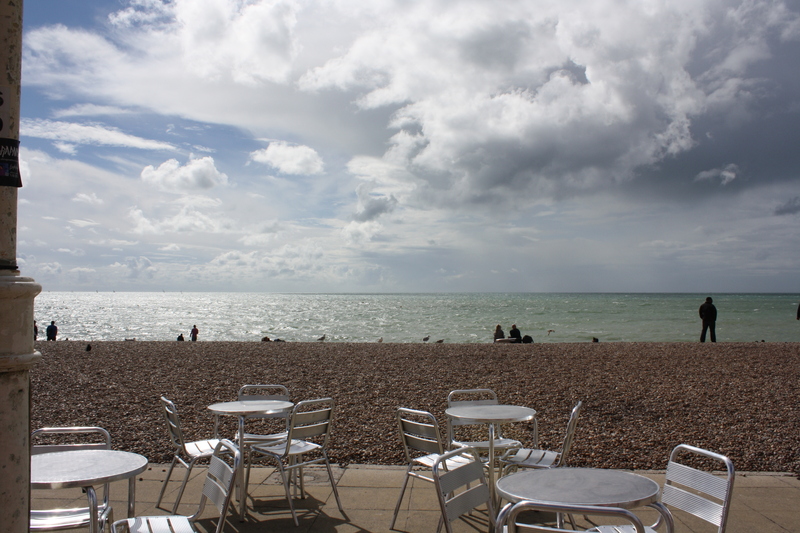 A Drizzly Day in Brighton. Warning: References to Charity shops will be made! 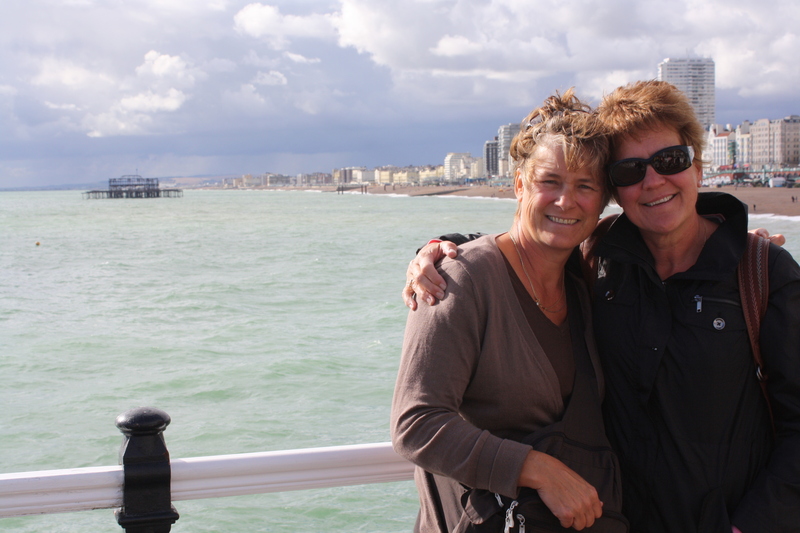 Yesterday my mom and aunt met Dana and me in Forest Hill and we bought group tickets to Brighton, which are apparently much cheaper than individual ones. The darn ticket eater ate my tickets after we got to Brighton and home, so I can’t put them in my journal full of keeping things, which is a little bit of a bummer. Oh well. 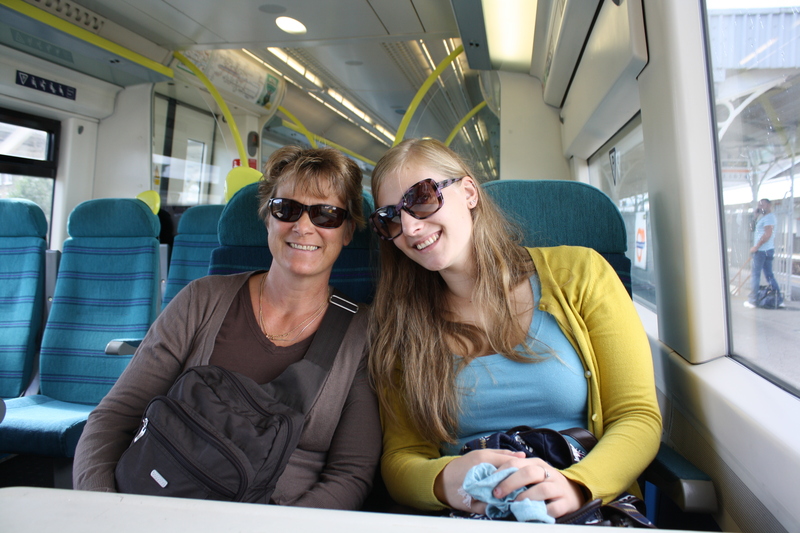 We had to switch to a long distance train at East Croydon, and we were off! The train only stopped a couple of times which is a relief, but originally we had to sit all in different rows, because it is much to easy for one person to take up a 4-person table area (2 seats are facing forward and 2 backward). This guy probably in his 20’s sat in one chair, had his newspaper sitting next to him, had his feet on the chair across from him, and had his bag sitting next to that seat. He seemed hugely inconvenienced by my aunt wanting to sit where his feet were so comfortably perched, and even more encroached upon when he was gathering his things and exiting the train and saw us all moving in on his prime real estate. 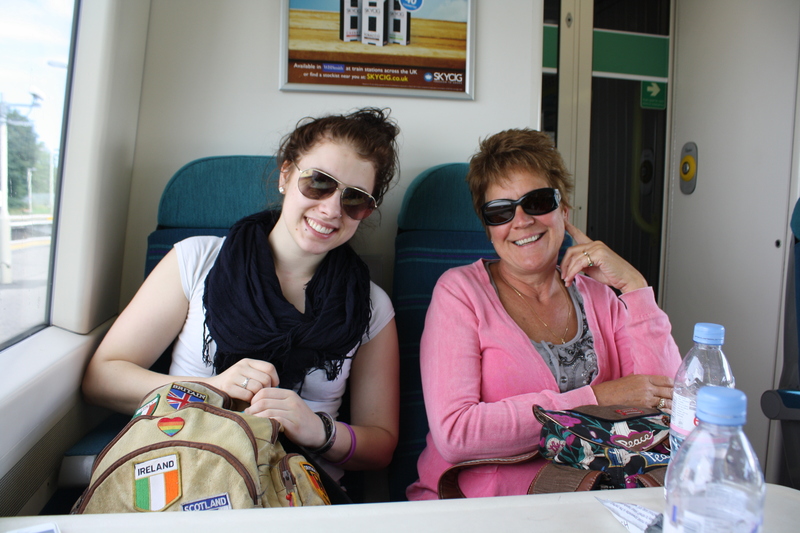 Here are some pictures from the train via my fully charged camera! We got to Brighton still pretty early in the day, and stopped for breakfast in this adorable mother/sister bakery and cafe called Ella’s. 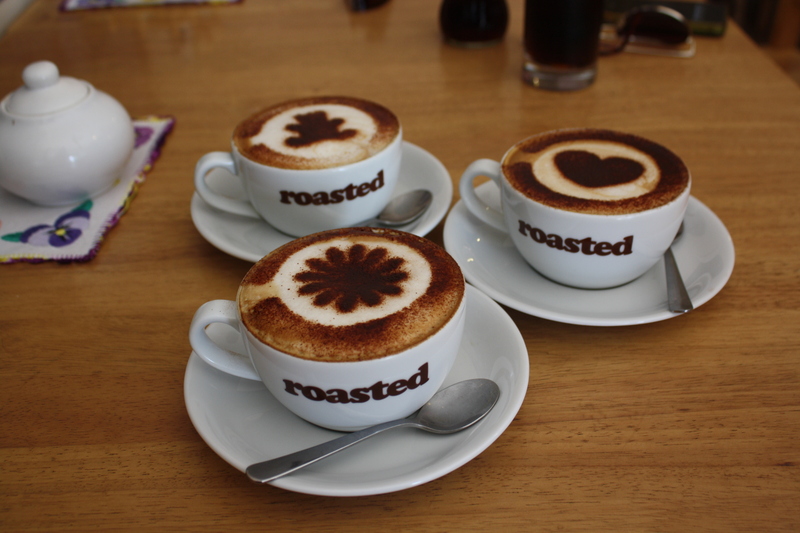 We got a few cappuccinos and were delighted to see the designs on the foam! A flower, a heart, and a teddy bear! Adorable! So after we had a bite to eat there we continued down one of the main drags to walk along the boardwalk. 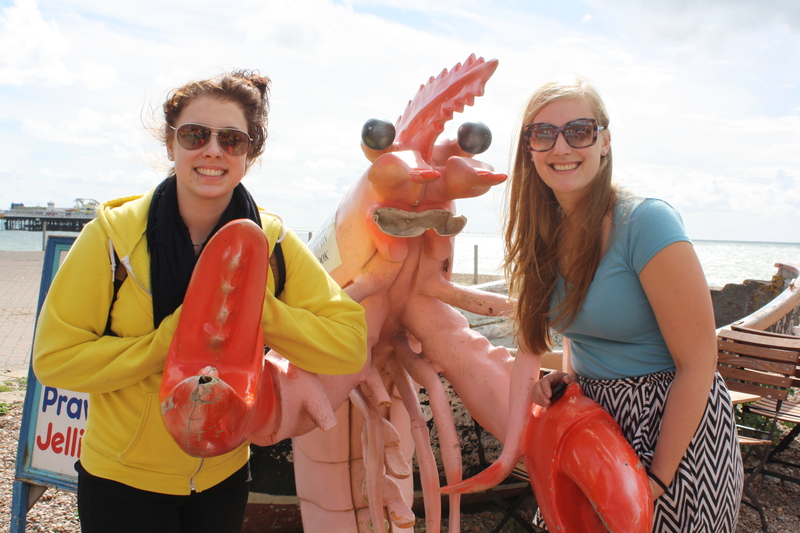 Then we ran into The Brighton Lobster, so of course we had to get a picture there! A sign on the side says tag photos with “The Brighton Lobster,” so I felt obliged to include/tag him (or her) in my post. Somebody broke off his lower mandible too so I do feel a bit bad about that. It started drizzling as we approached the actual pier (visible over Dana’s shoulder in the above photo) so we decided to make our way towards the Lanes, a well-known shopping area in Brighton. On our way up there, we came across the Brighton and Hove Food Festival, which would have been great if that was our intention, but the unexpected crowds and smells were a little overbearing so we plowed through and continued up to the Lanes. The shops in the Lanes are pretty varied: there are old and new bookshops, fancy dress stores, cafes, piercing/tattoo places, boutiques, vintage shops, antique stores, pretty much anything imaginable. We wove through a great antique store called Snooper’s Paradise, a huge maze full of independently-rented antique selling areas, so really there’s no ‘order’ to much, i.e. you couldn’t go to a section and find all of the jewelry, because two dozen sellers might have a little bit of jewelry in their booth area. That’s always a fun place to browse, and you could spend hours in there. But, the small bladdered and wary travelers we are, after not too long we had to find a cafe. We stopped at a cafe for a drink/bite to eat (some places have permit issues where they can’t serve alcohol unless they sell food with it, so we got a small plate of chips), then Dana and I were off again to do some charity shopping, because as neat as the lanes are, we are broke students and can’t afford to fall in love with anything they have to offer! For those who don’t know, Charity Shopping is, essentially, consignment shopping. Except different charity shops actually have the name of the single charity they support on the front, i.e. “British Red Cross.” And the stuff they have is usually pretty cheap! They do require a lot of patience though, and you have to be in a certain mood/frame of mind when you take it on because it can be a day long thing! We just poked around for a couple of hours, though. I found a couple of belts, then on the way back, a book about the Universe. We met back up with my mum and aunt on the pier and when we finished drinks at the pub there, we started walking back along the pier to go home. ^Pictures of the sister sets on the pier. Note in the second picture the old pier to the left of the photo, burned down in a fire. Cool how it’s still standing there getting beat on by the ocean! Anyway, After this we began to make our way back up to the train, having exhausted ourselves and feeling ready to sit on the train and head back to the big city. We did take a wrong turn at a curve in the road on the way home, which was bringing us parallel to the ocean (away from the station at the top of the hill), but we got back on track and caught a train home. There was one guy sitting in a 6-person table area that saw us trying to sort out how to sit and moved, how very nice of him! As the train was going, we saw a man who looked homeless walk by with a large backpacking type backpack. he sat a few rows behind me and after a while, took his shirt right off! It must have been wet from the rain. He was kind of muttering to himself a bit too, and I couldn’t look back there after a while because it made my heart hurt! I wished there was something I could do to help him but he seemed very focused on what he was doing so I didn’t want to intrude. Plus, it seems in England, it would have been impolite to acknowledge what we could all so plainly see. Plus, he wasn’t wearing a shirt for most of the ride so it would have been odd to approach him in his partially dressed state. My thoughts were with him as we traveled back home to our warm-ish accommodations, I hope he was headed somewhere he could get a good night’s sleep! 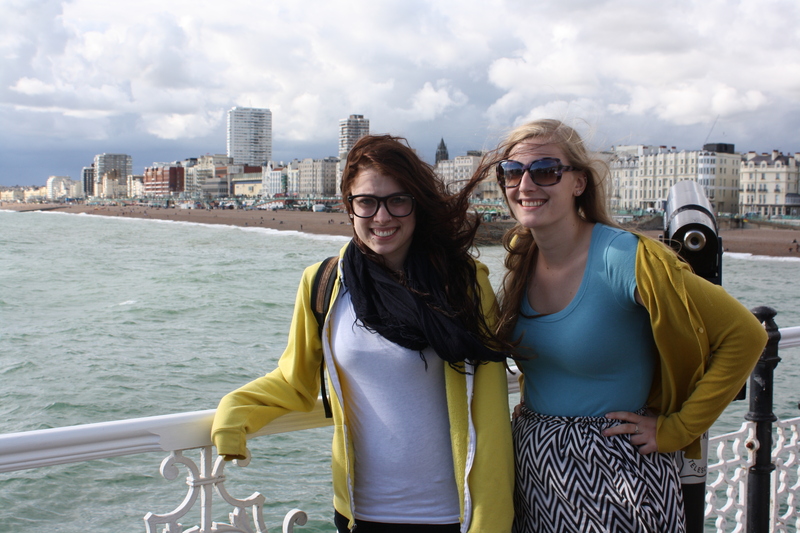 Well that was Brighton, an exhausting day trip, but very fun all the same! Today we are having more of a lazy morning while my mom and aunt take care of laundry before they continue their trip on to Greece on Wednesday, then this afternoon we have the Hint Hunt, which is the hottest attraction in London right now. Essentially, your group gets locked in a room and has an hour to figure out an escape. I don’t want to say any more (nor do I know much more) because I don’t want to ruin it for anyone! I’ll update about it after we return! This entry was posted in England, Traveling and tagged Brighton, Charity Shops, England, Hint Hunt, The Brighton Lanes, The Brighton Lobster, Trains, travel. Bookmark the permalink. ← Update about Updating = meta-update?